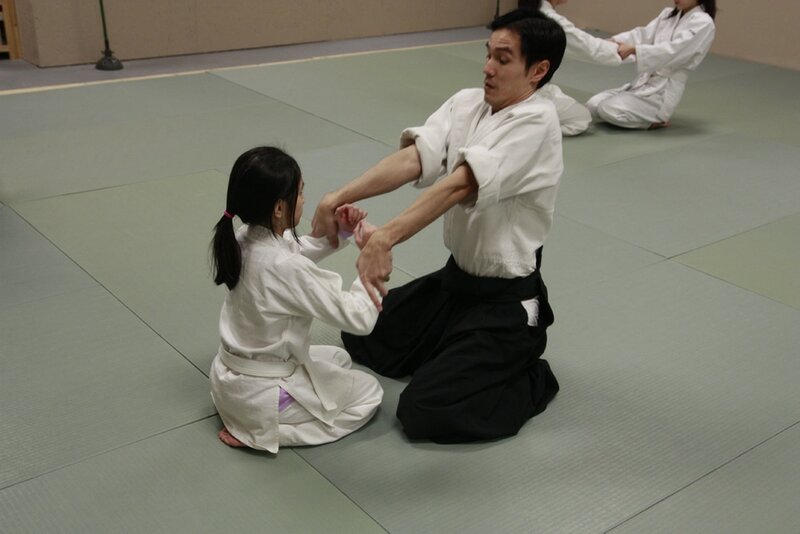 The youth class is combined with the Adult Aikido/Daito Ryu class. The combined class is a structured learning environment where students will interact with teenagers and adults. This class can be very challenging physically and mentally. We practice: falling safely, balance within body movement, and awareness of self. Growth is personal and dependent on the work put in by each student. Most of all, they have a lot of fun practicing together and making new friends! We focus on principles and technique. Students will learn various stretches to improve flexibility and joint mobility. There is no competition or sparring. Each student's progress is recognized based on his/her dedication and consistent effort during practice. The class curriculum is the same as the Daito Ryu Aikijujutsu Study Group for adults. The first class is free and continued attendance is dependent on the approval of the instructor. Please contact us if you have any questions. Thank-you. Please have the student wear comfortable and weather appropriate clothing. Athletic wear and long pants are recommended. Students will normally be barefoot on the mats. Socks are not recommended as they can be slippery, but are accepted.